EMA clarified the claim that Hyflux’s financial problems were caused by “an unexpected domestic policy change”. EMA explained some of the safeguards that are put in place to protect consumers in the Open Electricity Market. EMA replied to Dr Jimmy Chih-Hsien Peng's letter, explaining how the Open Electricity Market benefits the consumers. EMA replied to writer Albert Tang's query which explained how retailers could offer rates that are lower than the regulated tariff. EMA explained that the Open Electricity Market aims to give consumers more choices when buying electricity. It is not compulsory for consumers to switch and there is no deadline for switching. Those who had switched pay an electricity rate which is on average about 20 per cent lower than the regulated tariff. ST carried replies by both EMA and Senoko Energy on a separate forum letter asking that electricity retailers comply with the Personal Data Protection Act (PDPA). EMA’s reply highlighted that it has reminded all electricity retailers to comply with the PDPA. EMA replied to Paul Chan Poh Hoi's letter to explain that the Open Electricity Market provides consumers with more choices when buying electricity. There will be no disruption to electricity supply if a retailer ceases operations. The Open Electricity Market will provide consumers with more choices when buying electricity. We recognise that not everyone may wish to switch to a retailer. Hence it is not compulsory to switch and there is no deadline. 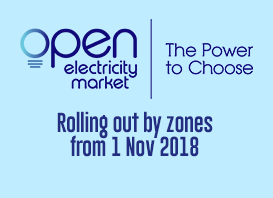 The Open Electricity Market gives consumers more choices and flexibility in their electricity purchases. This will incentivise the electricity retailers to offer more competitive pricing and innovative offers. EMA regulates the energy sector to protect the interests of Singapore consumers. EMA also safeguards reliable energy supply to Singapore consumers and promotes effective competition in the energy market. EMA replied to Mr Narayana Narayana's letter in Today explaining the methodology for setting the electricity tariff.